Well known throughout Africa, the Hooded vulture (Necrosyrtes monachus Temminck, 1823) belongs to the order of the Accipitriformes and to the family of the Accipitridae and is the only species assigned to the genus Necrosyrtes. Exclusively African, it is, along with the typical Egyptian vulture (Neophron percnopterus) with whom it partially shares the territory, one of the smallest vultures of this continent. Even though in the behavior, in the size and in the shape it much resembles this last, it has been ascertained that it does not have any genetical relationship with the same, hence the collocation in a new genus even if during the last decades it was included, by some, among the Neophron. It stands surely among the most common and most in contact vultures with the humans, in fact it is often observed in numerous flocks around the inhabited areas, the dumps and the slaughterhouses and wherever is the availability of eatable organic wastes. In particular in the Horn of Africa it is present everywhere in great number and lives usually in contact with the population actively carrying the duty of scavenger in the roads and around the dwellings, along with the Fan-tailed ravens (Corvus rhipidurus) and, in Ethiopia, with the endemic Abissinian thick-billed raven (Corvus crassirostris). Same behavior has been noted in the western part of its range where it is strongly gregarious whilst in the southern part of the African continent has a less social behavior and is confined in the vast savannahs following the herds of grazing herbivores. It is often seen carefully following the big hunting carnivores well knowing the award awaiting them at the end. 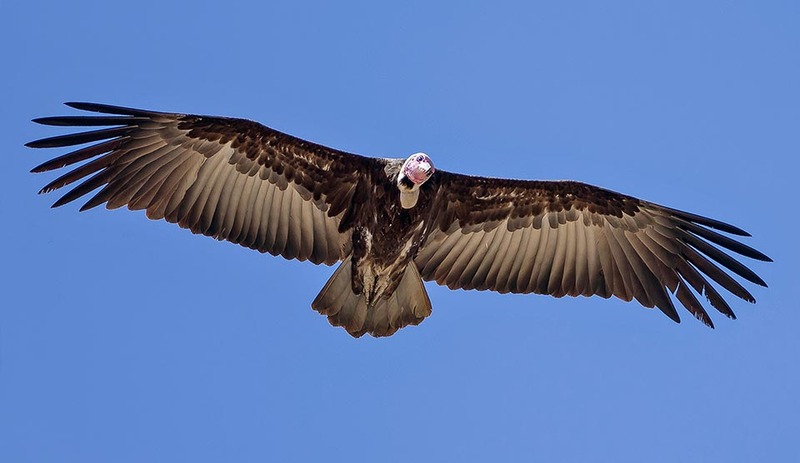 Some scholars have ascertained that the reduced size of this vulture allows it to take flight also early morning when the air temperature has not yet reached the optimal thermal conditions for the flight of the big raptors and therefore to stand among the first to discover the presence of carrions. The etymology of the scientific binomen has as usual Greek and Latin origins, Necrosyrtes from “nekros” = corpse and “suro” = to pull with difficulty and monachus = monk, due to the zigged head. 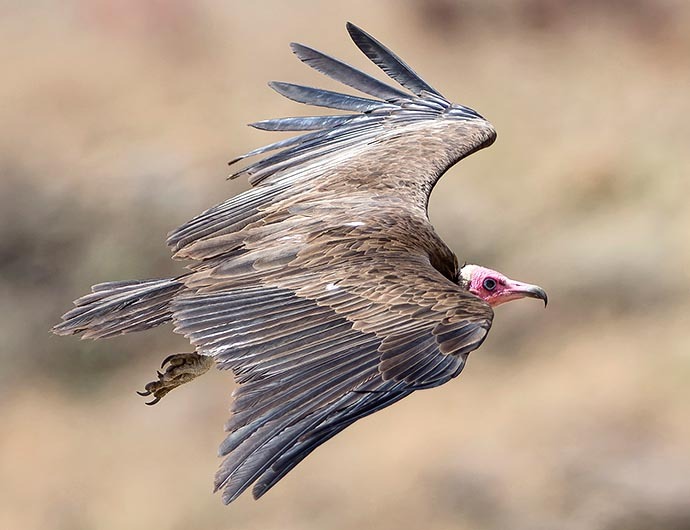 Some common European names are Hooded vulture in English; Vautour charognard in French; Kappengeier in German; Alimoche Sombrío in Spanish. In Italian it is called “Capovaccaio pileato” to describe the head practically bare but covered by a slight but dense down. 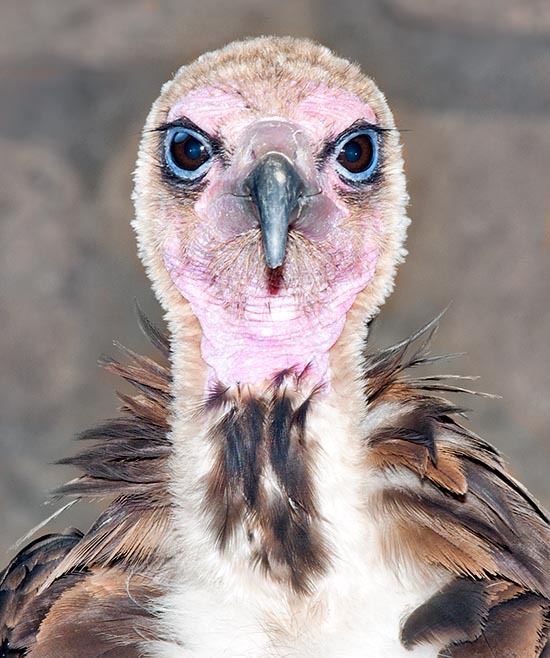 The diffusion of this vulture is specific to the African continent. It is diffused in the sub-Saharan area and covers totally the African territory with a more or less marked diffusion. Is absent or is considered as little diffused in the equatorial forest areas and in the purely desert environments but results fairly diffused in the inhabited areas, in the cultivated zones, on the edges of the forests and in the savannahs frequented by great herds of herbivores. It ranges over the Ethiopian highlands from the 3000 m of altitude up to the sea level. Whilst it gathers in great number in the inhabited centers, in open savannah usually lives in reduced colonies and in the south of the continent is even often met in pairs isolated and absolutely not social. Usually it is a sedentary raptor and does not go too far from the native places if not for occasional juvenile dispersions or for short distances when following the herbivores migrations or for more favorable weather conditions. This last movement is seen mainly in the areas close to the deserts where the rainfall more clearly affects the presence or not of grazing animals. 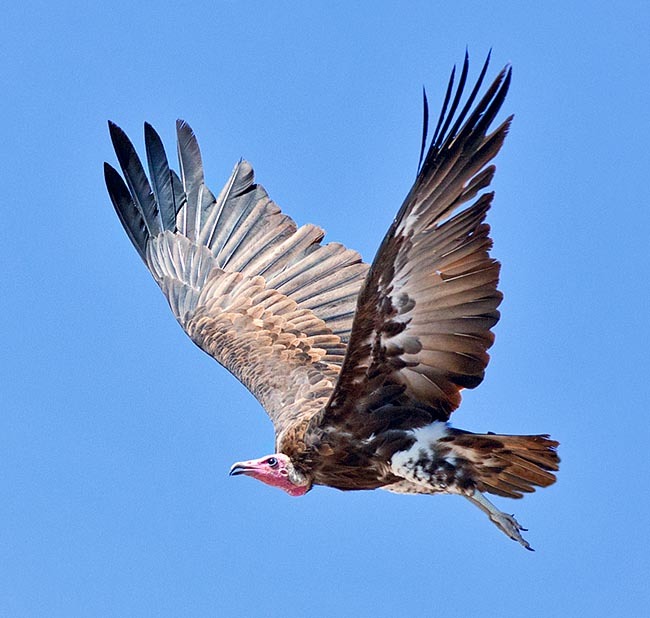 There is no inhabited center in Sub-Saharan Africa that does not see the presence of this vulture on the roads as well as perched on the roofs and on the stakes of the power lines waiting for some leftover to gulp down. This characteristic has rendered it quite familiar and accepted by all the African populations. As a matter of fact, it is considered as a useful animal for the activity it carries on even if often, in some areas, it is caught for being consumed or sold in the markets as flesh of a common domestic bird. 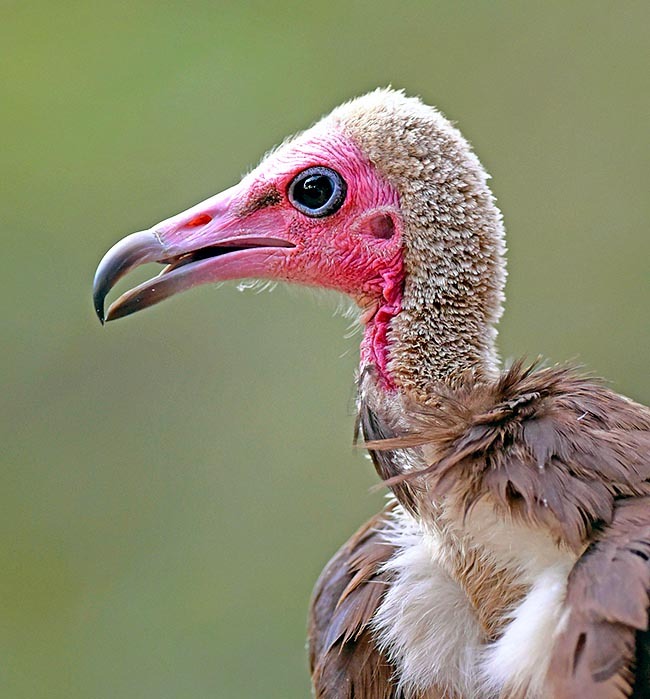 Some parts are sold also for medicinal purpose as the vultures are often considered in Africa as fetishes in the popular medicine and in sorcery. Despite having a much hooked beak, sharp and long, this bird is not capable to drill and cut the thick and hard skin of the carcasses of the big herbivores therefore after the discovery of the carrions, it must wait for the help of the big vultures that immediately come and begin the hard work of nicking this hard armor. Like all vultures, it does not disdain to integrate the diet with big insects, small nestlings or eggs found on the ground and with some small rodent. Although of small size if compared with the big African vultures, the hooded vulture has a wingspan of not less than 160 cm, a length of about 70 cm and a weight reaching the 2,5 kg. There is sexual dimorphism even if the female is slightly bigger. The adult is a practically dumb bird that never emits any sound relegating the only chirps to the stage of chick when still in the eyrie. It has a very balanced twirling able to take advantage with great skill of the even smallest thermal, then remaining in flight for hours without the least effort. Often it goes along with the marabou (Leptoptilos crumenifer), its antagonist in the villages, during this activity as well as while looking for food. The livery is no too evident and somewhat unassuming but with characteristics that render it easily to be distinguished from any other vulture. The head and the neck are completely featherless and are covered by thick and short whitish down often dirtied and stained by the organic liquids of the carcasses they have eaten. On the back of the head this down is more evident and forms a sort of a hood that stretches then behind up to the base of the neck to form a whitish collar. The face is bare and the cere may have a different colour going from grey, to pink to red and also to bluish and this seems to be an indicator of its state of excitement. The upper plumage of the wings is usually of a compact brownish cream colour whilst the body is usually of a paler brown hazel colour. The underwing is characteristic and evidences a very clear belt on the lower coverts of the remiges. The tail is squared contrary to the Egyptian vulture (Neophron percnopterus) who has it rhomboidal. Also the shape of the wings is more rounded and less pointed than this last, characteristics that render it easy to identify. The slightly pronounced colour of this raptor does not determine big differences between the livery of the young and that of the adults, excepting the down covering the neck and the head that is darker and the face usually more pinkish in the young. Moreover, the underwing has a uniform colouring without the characteristic pale band evident in the adults. The reproduction of this vulture may happen all over the year regardless of the chosen area and of the weather conditions of the moment. It is a typically arboreal bird and often chooses the nest occupying old nests of other big raptors, carrying new branches and leaves till when it is suited to its needs. When it is itself building it, chooses stately trees placing it in very high positions that dominate the underlying area. The nest is used again for many years and is left only when it becomes irrecoverable. They rarely form colonies, perhaps more for the impossibility to find big trees close to each other in a particularly open area like that where they do live, seen instead the remarkable sociality shown during the other periods of the year. Like most of the vultures it lays only one white egg, strongly spotted brown on the base, that it hatches for not less than 7 weeks. This task is performed mainly by the female fed by the male during the whole period replacing her a times during the night. The chick remains in the nest for a period that may reach the 4 months even if often it abandons it before, remaining perched on the higher branches before taking off. The young remain dependent from the adults for not less than further 4 months, and so the complete cycle of nidification gets often to cover the entire year. The couple is stable for the whole life and the partners remain linked also out of the reproductive period. Though present in great number it seems that the overall population is suffering from a continuous decrease caused, besides the illegal hunting pressure, also from the accidental poisoning due to the consumption of poisoned baits prepared for the big predators. It is indicated as an endangered species. Neophron monachus Britton, 1980; Gyps monachus Winck, 1980.